How cute is this ‘Happy’ t-shirt from the fabulous TOTO & FIFI? I love a good slogan tee and I may have got our son Ethan into them too. Oops! We were so excited to receive this gorgeous t-shirt from the very talented Sarah, owner of TOTO & FIFI. Sarah is mum to Toto and aunt to Fifi (both nicknames) and it is mostly their original designs (along with other children’s designs) which feature on the clothes. Sarah handprints every item individually in her home studio in Cheshire. 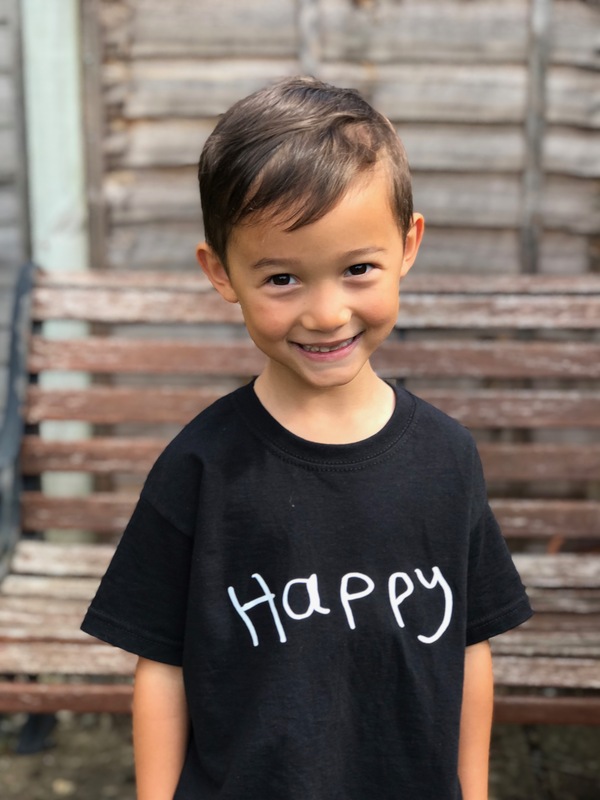 This lovely Happy tee, designed by five-year-old Toto, comes in either black or white, is available from ages 1-6 and costs £14 (price correct at time of press). Ethan is five years old and nearly 110cm (it’s his goal to reach 110cm by the end of the summer holidays – we’re only half a centimetre away), and age five in this t-shirt is perfect for him. Not too big but with enough room for growth. It will certainly last another year. The t-shirt is 100% cotton and Oeko-Tex approved, so you know the cotton hasn’t been exposed to any nasties during production. Ethan chose this t-shirt himself and we both love it. Being happy is what life’s all about, right? The t-shirt arrived quickly and was wrapped in super cute packaging. Buying from a small business like TOTO & FIFI is always such a lovely experience, and feels very personal. For more information on this t-shirt and other TOTO & FIFI products, please visit the TOTO & FIFI website. Disclaimer: This t-shirt was gifted to Mums Off Duty for the purposes of review. My reviews are always completely honest.